Filling out a form is one of life’s little hassles. Whether it’s a paper permission slip or a health questionnaire found online, the task of filling in the same fields over and over is time consuming and error prone. Adobe Fill & Sign transforms the old-world task of form filling into the modern experience of information at your fingertips. 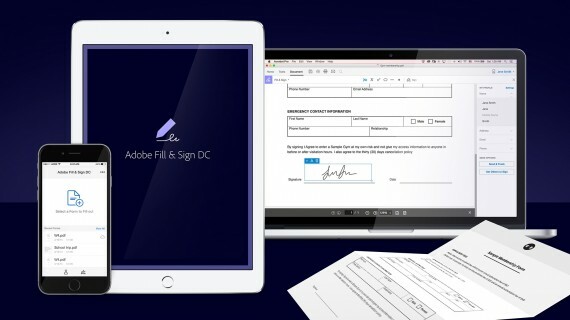 Fill & Sign makes it easy to capture a crisp and clean image of a paper form or quickly find forms online. It recognizes lines, boxes, and other form elements, making the task of adding information or ticking a box as easy as a tap. It remembers what you have entered before, and subsequently offers suggestions as you type. You can store your frequently used information in a profile, making it ready to drag and drop in place — this even includes your signature! Once your form is filled out and ready to go, it’s easy to send it off using the built in sharing options on your device. And every form you work on is saved so you can finish or reuse it later.